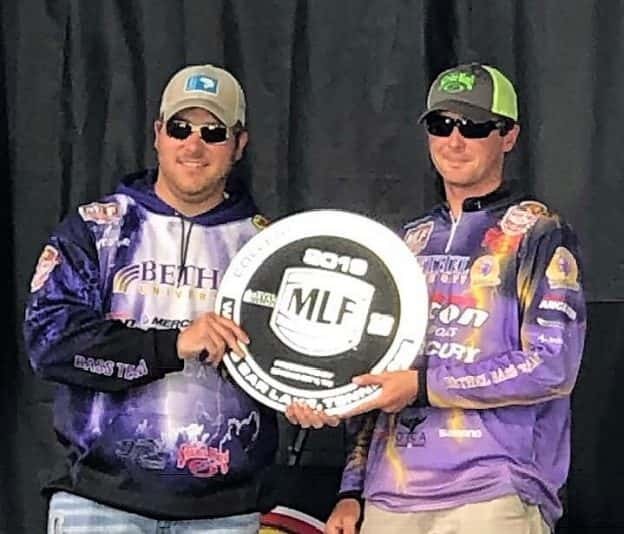 McKenzie, Tenn.–Bethel University won the very first Major League Fishing College Championship this weekend. Eight Bethel boats with 16 anglers competed in a head to head match up against the same amount of boats from in-state rival Bryan College from Dayton, Tennessee, according to Bethel Coach Garry Mason of Springville. The format of the Major League Fishing saw the top five boats getting points based upon the combined weight of each boat’s total catch of fish weighing over one pound. The Bethel team had a staggering 294 pounds of Largemouth Bass with a total of 156 fish for the combined top five Bethel boats, Mason said. The Bethel leaders were the team of John Garrett/Kyle Palmer with 86 pounds. Garrett Enders/Cody Huff had 72 pounds for second place. Cole Floyd/Carter McNeal boated 61 pounds for fourth place and KJ Queen/Dax Ewart took fifth place with 47 pounds.